The Dynamic Cone Penetration Test provides a measure of a material’s in-situ resistance to penetration. The test is performed by driving a metal cone into the ground by repeated striking it with a 17.6 lb (8 Kg)weight dropped from a distance of 2.26 feet (575 mm). The penetration of the cone is measured after each blow andis recorded to provide a continuous measure of shearing resistance up to 5 feet below the ground surface. Test results can be correlated to California Bearing Ratios, in-situ density, resilient modulus, and bearing capacity. The cost of purchasing or manufacturing a DCP test apparatus is relatively low. Currently, prices vary from $1,600 to $2,200 USD for portable hand-operated equipment. More expensive, automated DCP rigs can be purchased that are towable. Depending on the DCP apparatus the test can be conducted efficiently with as little as 1 to 2 people. 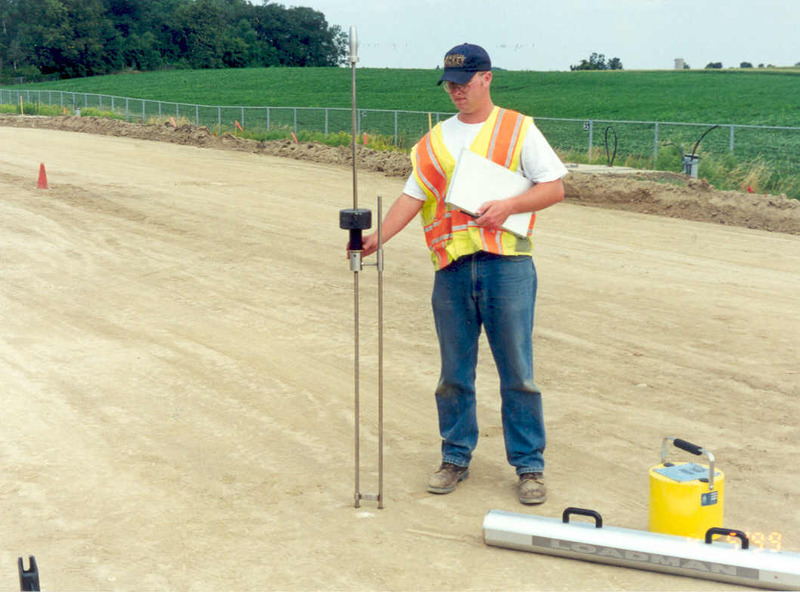 Again, dependent upon the test apparatus, depth of testing, and the condition of the subgrade, the test requires 5 to 10 minutes to complete. The DCP apparatus consists of a 5/8”-inch diameter steel rod with a 60 degree conical tip. The rod is topped with an anvil that is connected to a second steel rod. 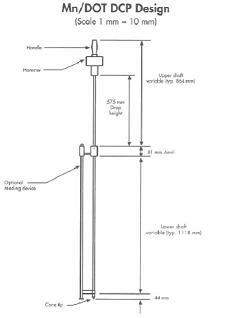 This rod is used as a guide to allow an 8kg hammer to be repeatedly raised and dropped from a height of 575mm. The connection between the two rods consists of anvil to allow for quick connections between the rods and for efficient energy transfer from the falling weight to the penetrating rod. Once the test apparatus is assembled the DCP is placed at the test location and the initial penetration of the rod is recorded to provide a zeroing scale. While holding the rod vertically, the weight is raised to the top of the rod 575 mm above the anvil and dropped. The penetration of the rod is measured after each drop. In cohesive soils the penetration rod may be rotated slightly to prevent binding of the soil and the rod influencing test results. The test shall be terminated if the desired depth is reached or if the rod penetrates less than 1/8-inch in 10 drops. Several correlations exist between common engineering parameters and the dynamic penetration index.